In Honor Of Design: *CLOSED* Giveaway: Elliven Studio Sequins & Ruffle Clutch! 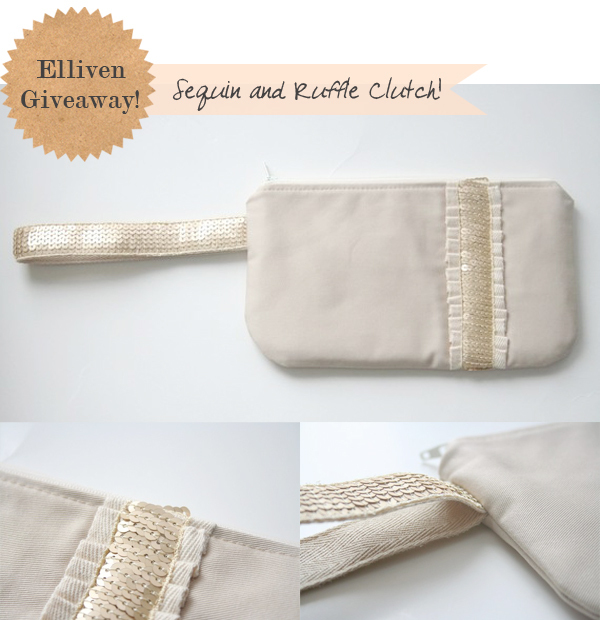 *CLOSED* Giveaway: Elliven Studio Sequins & Ruffle Clutch! Isn't it a beauty?!! I bought one of these a few weeks back as a gift and just want to keep it because its perfect! Julie is the talented mama behind Elliven Studio. I could rave and rave about this girl! She is so genuinely kind, a talented designer, and her product from package to detail is flawless! 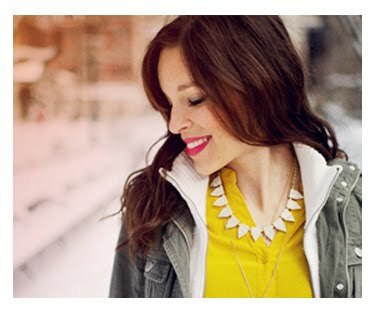 She is offering one of my favorite products to one of you readers! The sequin and ruffle clutch! Read about it here. Ready to win? - Visit Elliven Shop and tell us your favorite item! I love the skinny floral clutch! Just tweeted about it too! 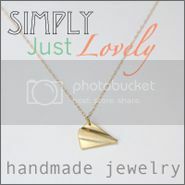 There are so many cute items in Julie's shop, but the Chevron zipper pouch really caught my eye! Thanks for hosting such a fantastic giveaway, Anna. And I'm tweeting about it (though I schedule the tweet for later today). I love the Amy Butler receipt/coupon holders - so cute! I am usually not a sequins girl in the least, but THIS clutch is adorable! Wish I had it for tonight (my anniversary with hubby!) for a night out on the town! Ok - until I visited her shop just now, I never realized how much I need adorable little clutches like hers! I am in love with so many of them! I love the zipper pouch with the multi-color stripes on it. I'm a follower and I love the Sequin and Ruffle Green Houndstooth Skinny Clutch and the Mini Zipper Pouch with Removable Strap in the pink chevron. too cute!! (i'm a follower) i love the amy butler ruffled receipt/coupon holder! I love the small zipper pouches!! This is the one clutch I love, though it was hard to make a choice. My fave is the snap card case. I totally need one! And I'm following Julie on twitter! I'm a subscriber via Google Reader. I like the skinny clutches with the removable clip. Thanks Anna! I like the skinny floral clutch and I'm a GFC follower! I adore this clutch http://www.etsy.com/listing/68027888/skinny-clutch-anna-maria-horner ! I love that exact clutch! I think it is just perfect for Spring time dates. Her fabrics are so fun - it's hard to choose! Definitely could use some of those cute little snapped cases and a bunch of those little pouches! The Sequin and Ruffle Pink Chevron Skinny Clutch is super cute! already a happy follower! i love the elliven mini card wallets. I follow via GFC and I love the Skinny Clutch with Removable Strap - Anna Maria Horner!! The skinny clutches with small florals or the mini card wallet with small florals on navy background are too cute! I really like the Fabric Ruffle Notecards. Just the thing to spur on my thank you note writing! Those floral clutches are too cute. Love the sequins and canvas too. It can take you from day to night! I'm following Julie on Twitter! i love the ruffled note cards! great stationery! i follow you and miss Julie! I now follow Julie on twitter. @lauralillypie :) thanks for the opportunity to win. 'preciate it! What an adorable clutch! I also love the Riley Blake Skinny Clutch. Julie really is extremely talented! I'm already a follower of her blog! It's so hard to choose just one favorite item but the ruffled notecards really caught my eye. They're super unique-- I've never seen anything like them before! I LOVE the beautiful fabric notecards! What a wonderful way to say "Thank you" or just a simple "Thinking of you". wonderful. wonderful. wonderful. Love the small zipper pouches! Especially the tropical print! I LOVE Julie's clutches - especially the sequin and ruffle ones! Pretty! I looked in her lovely Etsy store, and I have to say that the sequin and ruffle clutch is my favorite, followed by the grey linen skinny clutch. you always have the best giveaways! I love her floral snap card clutch. so cute! great giveaway - i like her iphone sleeves, very practical. The black and white one looks classy. 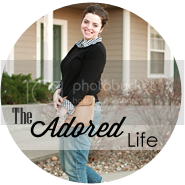 The small sequin ruffle pouch is actually my favorite! I love the tone on tone, but also adore the pale gray/pale blue pouch, too. Amazing work!! Also following her on Twitter. woohoo! I love Julie's ruffle note cards. So clever and fun! Follower on GFC. Love the Slim Zipper Clutch or Pouch, the pop of red on the zipper is great! Fingers crossed! I love the mini card wallets. Follow and adore the Small Zipper Chevron Pouch. I follow on twitter both of you lovely ladies! i'm a new follower of julie on twitter! any of the small zipper pouches... how cute for my lip glosses which I tend to just toss in my purse! My favorite is the: Simple Grey Linen Skinny Clutch with Twill Ruffle. I'm really loving this cute little pouch! Shared on Facebook! LOVE LOVE LOVE! yay! 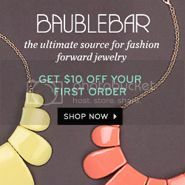 another fabulous giveaway... I really love the Small Zipper Chevron Pouch... thx. Love Love Love the ruffle and sequin clutch. I have been eyeing them for awhile. They are beautiful! Tweeted about the giveaway. Twitter account under @RhondaDdesigns. Adorable! She has the prettiest fabrics! Love the Mini Card Wallet - Amy Butler! my favourite item is "Skinny Clutch - Riley Blake"
My fav item is Skinny Clutch - Anna Maria Horner. My favorite piece is the mini card wallet- Michael Miller. Just might have to get it!!! I am a follower & I LOVE the Mini Card Wallet - Joel Dewberry. Such a great shop! http://twitter.com/#!/cclancey just tweeted about it!